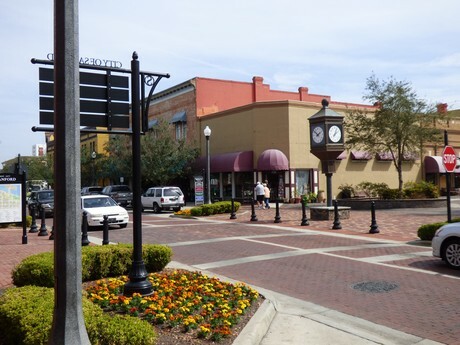 Seminole County's oldest city and its county seat, Sanford enjoys a blend of historic charm, natural resources, and modern amenities. 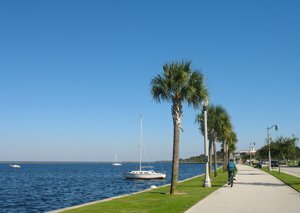 The area's downtown is located on Lake Monroe, through which the St. John's River flows. Sanford residents enjoy historic neighborhoods, antique shopping and eclectic dining downtown, as well as a genuine small-town atmosphere. In recent years, much growth has occurred in the western sections of the city with the opening of Seminole Towne Center, a 1.2 million square foot mall. Several upscale golf and gated communities are being developed in west Sanford. 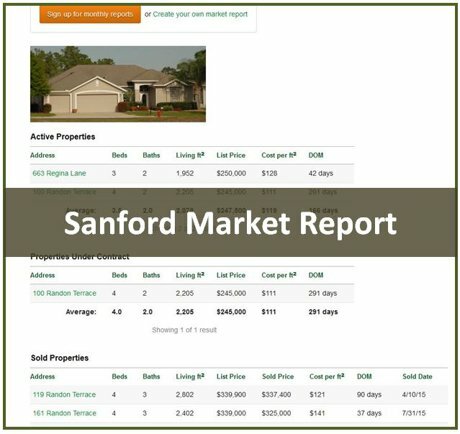 Sanford has managed to balance its small town charm with some of Central Florida's most explosive growth. The recently expanded Orlando Sanford airport, a former naval air station, now welcomes thousands of British tourists on charter flights every week, as well as several small domestic airline flights. 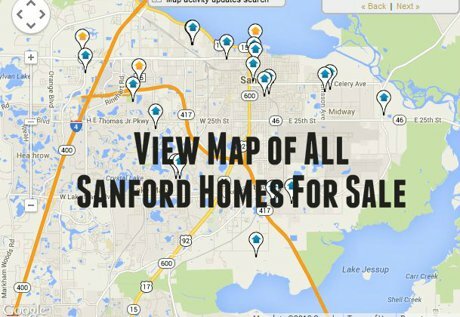 Click here or on the blue button above to view all Sanford homes for sale. Few cities offer the unique combination of historic charm and waterfront beauty that downtown Sanford can. 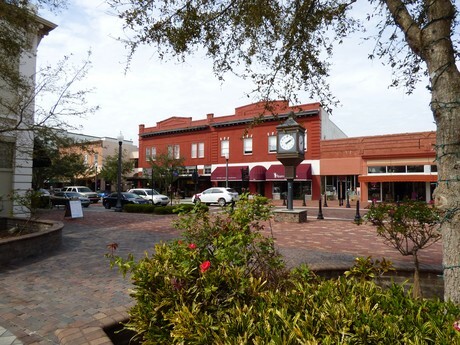 With it's brick tree-lined streets and historic architecture, Sanford's downtown has been revitalized into a charming community of vintage antique shops, art galleries, sidewalk cafes and quaint watering holes. 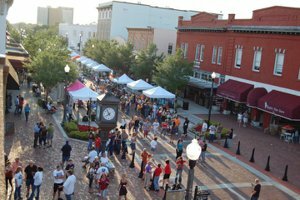 The second Thursday of every month, downtown Sanford hosts a street party called Alive After Five, with food and beverage sampling, live bands, local artists, and entertainment. Alive After Five features a different theme every month, like Blues and Barbecue, Football Kickoff, etc. The city of Sanford in Seminole County is located on Lake Monroe. Lake Monroe is a wide, shallow area of the St. Johns River located between Seminole and Volusia counties. The 9,400 acre lake is part of the Middle St. Johns basin. Monroe Harbour Marina in Sanford has slips available for wet storage, dry storage, sales, and repair facilities .It is also home to U-Sail Central Florida and St. Johns Rivership Company, which offers dinner cruises on a paddle wheel riverboat. Several world powerboat speed records have been set on Lake Monroe, because of the shallow average depth (7 ft) and prevailing southeasterly Winds. 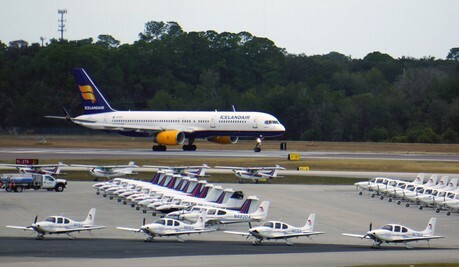 Originally built as a naval air station, Orlando Sanford International Airport is the Orlando area's secondary commercial airport, serving primarily British and European charter jets booked for leisure travel. It is also a main focus city of Allegiant Air, a domestic jet carrier serving mid and small-sized airports across the U.S. In addition, Icelandair offers scheduled international flights and the the airport is home to Aeroism Flight Academy, a subsidiary of Delta Airlines. Because of the flight training, OSIA is one of the 30th busiest airport airports in the world in terms of flight operations (total landings and takeoffs). 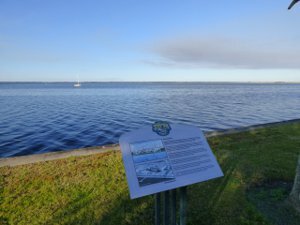 The Sanford Riverwalk is a two mile long scenic paved trail following the Lake Monroe shoreline from Central Florida Regional Hospital to Mellonville Ave. The trail allows access to Ft. Mellon Park and downtown Sanford and it has many benches and pavilions with swings to stop and enjoy the view. Future plans include extending the trail to Interstate 4 and eventually crossing the river to connect with Volusia County trails. Ft. Mellon Park is a city of Sanford park located on Lake Monroe in downtown Sanford. 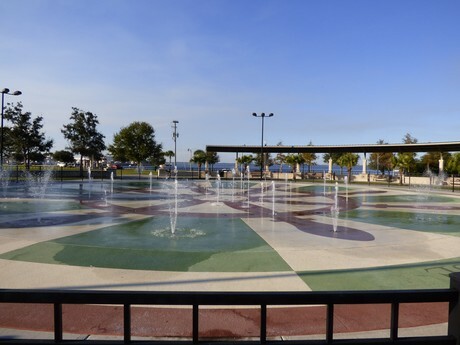 The park features a modern fort playground with Play areas for both younger and older kids, numerous pavillions and picnic areas, an open field area, a splash pad, basketball court, a fitness trail, and wonderful views of the lake. Ft. Mellon is right across the street from the Riverwalk trail. Sanford is known for its historic homes and old-style downtown. 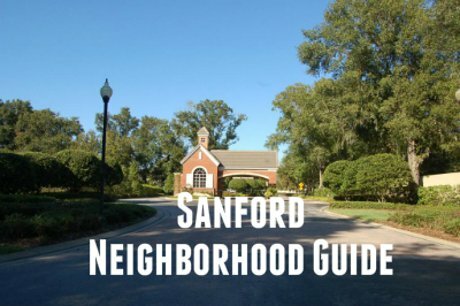 There are two historic districts in Sanford listed on the National Register of Historic Places. 26 buildings are listed in the Commercial Historic District, dating from 1877 to 1924. 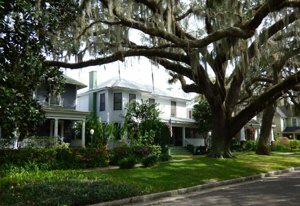 In the Old Sanford Residential Historic District, there are 434 homes listed with a wide range of architectural styles represented, including Queen Anne, Colonial Revival, Prarie, Craftsman, Mission, and Spanish Eclectic.